Ardvreck castle is a small ruined tower house built on a peninsular on the north shore of Loch Assynt in Wester Ross. It is built on the L-plan with a main hall block and smaller stair tower attached to one corner. The stair tower is round at the base, with square upper floors, and there is a small stair turret serving these upper floors. The entire north wall of the hall block has disappeared. Assynt was confirmed to Torquil Macleod of Lewis in the reign of David II. His ancestors traditionally held the area as early as the mid 13th century. His second son Norman was granted Assynt as his portion, and Norman’s descendants held the lands from the Macleods of Lewis. A ditch and bank cutting across the peninsular probably reflects the earliest fortification of the site, and it may be that some of the ruined courtyard walls predate the tower, but this is not confirmed. The castle was built in two phases, first the rectangular hall block was built, with two vaulted cellars and a vaulted first floor. This was four storeys high, with the upper floors of timber. It is likely to have been built in the late 14th or early 15th century, and to have been entered at the first floor. This was extended in the 16th century with the stair tower, and at this point it is likely that the roofline was altered with gables rather than a flat battlements roof, as well as improvements such as shot-holes. In 1650, the laird of Assynt captured the fugitive Marquis of Montrose, and handed him over to the Earl of Argyll for execution. 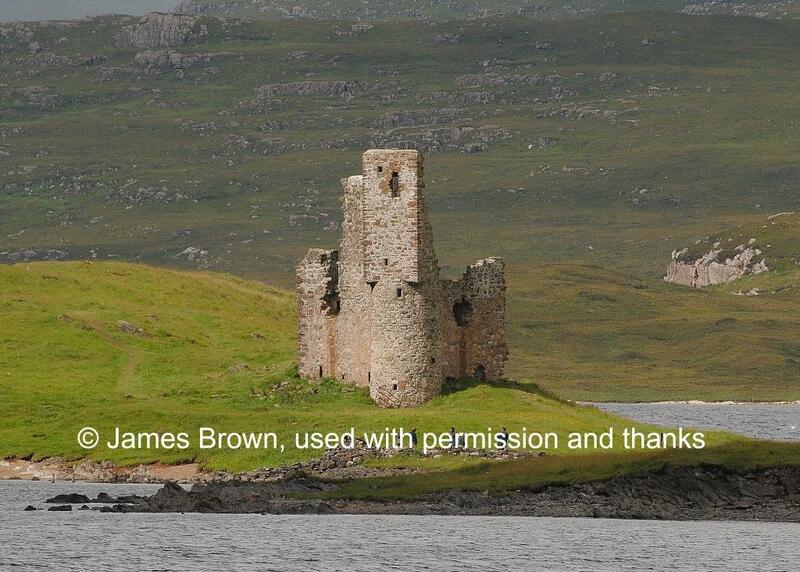 This was later to come back on the family, who were pursued by the Mackenzies, who besieged and took Ardvreck in 1672. The castle was burned out and abandoned, never to be reoccupied. It is accessible to look at from outside by footpath, but is unsafe and fenced off due to falling masonry.